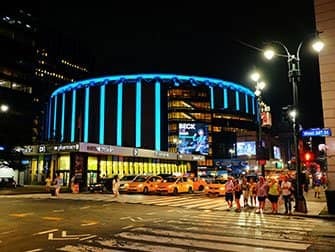 Madison Square Garden (MSG or The Garden as it is also called) is the best known and largest event hall in New York. It accommodates up to twenty thousand people, and hosts many concerts and sports events each year. 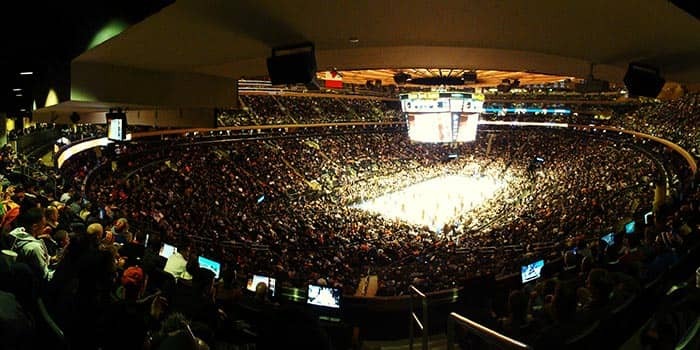 It’s home to basketball team New York Knicks and the New York Rangers ice hockey team. You will find a cinema, a theatre, a restaurant and a conference centre as well. MSG is so famous, it even has its own television channel. Madison Square Garden hosts concerts by some of the worlds greatest stars. Someone who is allowed to perform in this very place, will follow the footsteps of Frank Sinatra, Elvis Presley, Michael Jackson, Madonna and our own rock band Queen. This venue is not only in history books for its pop history though. This was also the place where the Republicans, led by George W. Bush, held their Convention in 2004. Madison Square Garden that we know today, isn’t the original stadium. The first one was built in 1879, at Madison Square. It served primarily as a circus tent. In 1890 this building was demolished, to make way for a new variant at the very same spot. In 1925, MSG moved to the intersection of 50th Street and 8th Avenue. The hall we know today, dates back to 1969 and is located above Pennsylvania Station. Like to have a look behind the scenes in such a big event complex, or just curious about the venue itself? Join the Madison Square Garden All Access Tour. You will even enter the dressing rooms of the famous teams like the Knicks and the Rangers, who call this place home! Meanwhile you’ll pick up on some history about epic moments that have been taking place there during the last 130 years. 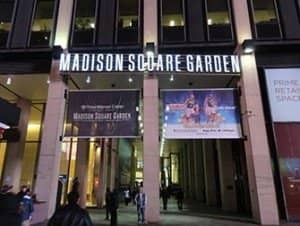 How to get to Madison Square Garden? It’s easy to get to Madison Square Garden as it is situated in midtown Manhattan. The round building sits atop of Pennsylvania Station, on the 7th Avenue (between West 31st and West 33rd Street). Seeing a concert or a game there is relaxed as you can probably just walk to Madison Square Garden from your hotel. If you are staying further, take the subway: lines A, C, E to Eighth Avenue station. Or take lines 1, 2 or 3 and get off at Seventh Avenue in Penn Station. There is no place to store any personal belongings so don’t bring any big bags with you. Your bag must fit under your seat. Did you know that during the hockey season the ice rests underneath the basketball court? That way you can watch a basketball game during the day and a hockey game at night! Eric’s Tip: If you get the opportunity to go to an event at Madison Square Garden you should absolutely take it! It is always fantastic to experience a sports game or concert amongst an audience of enthusiastic New Yorkers. Due to it’s central location, the arena is also very easy to get to. Events and concerts in Madison Square Garden? 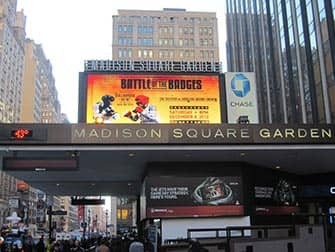 You find an overview of upcoming concerts and sports events in Madison Square Garden here.